Home • Authors • Mike Sirota on Writing, Indie Publishing and His New Release! Mike Sirota on Writing, Indie Publishing and His New Release! For Mike Sirota and his readers, that’s a very good thing. Mike is one of my favorite people, and not merely because he edited In Her Shadow and was wearing a Beatles shirt when I met him (although obviously—perks!). He’s as kind as his tales are terrifying and seems to enjoy writing and helping fellow writers equally—both of which say a lot. 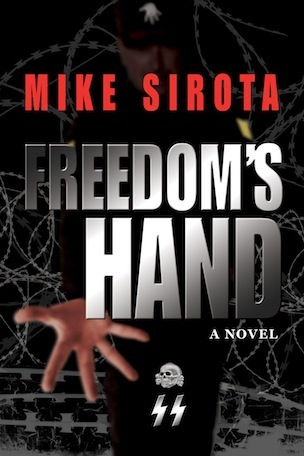 I’m reading his brand new release, Freedom’s Hand, now and have to say—it’s AWESOME. If you enjoy character-driven, suspenseful, heart-wrenching stories (and who doesn’t?!? ), I highly recommend that you zip over to Amazon and nab a copy. Read on for more of the ins and outs of his wonderful story and why it came into fruition. As a teenager, Nathan Adler barely survived the horrors of the Auschwitz death camp at the hands of the Nazis. Fifty years later he could not have imagined that he would live the nightmare again. This time, however, the concentration camp is not in Poland. Erected by Freedom’s Hand, it exists as a citadel of suffering and death—in the desert of the American Southwest. AM: You set this story aside for quite some time before moving forward with publishing. Why now? MS: Actually, I’ve made a few half-hearted attempts at marketing Freedom’s Hand in its nearly three decades of existence. Let me go back to its beginnings to say that, initially, I never planned on completing the manuscript until a publisher had made an offer. My then-agent convinced me that Simon & Schuster would take it on, but I needed to finish it. So I did—and they didn’t. Too controversial, or something like that. Imagine that—ME controversial! Afterward, I just left it “in the drawer” and went on to the more fun things that I enjoyed writing—until my long estrangement from the writing game. But last year I pulled it out of the drawer and re-read it, as I did with a few other unpublished projects. Aside from some easily reparable crappy writing, I found it a powerful story, and I recalled how much emotion I’d put into it so long ago. I also realized, sadly, that it remained relevant even today. Hatred and intolerance always seem to be in vogue. People are tortured and killed by the hundreds, the thousands, and more in the name of twisted ideologies. For me, this makes Freedom’s Hand somewhat of a statement. AM: Amen to that. Any advice for writers who are grappling with similar issues—wondering when to set a story aside versus self-publish it or seek representation? MS: I don’t think that my experience with Freedom’s Hand and what you’re asking is an “apples-and-apples” thing. If I were a new writer and had a finished manuscript, I would want to see it published as soon as possible. But in my experience, most novices cannot be objective enough to judge if their project is ready, or as I call it—professional grade. They’ll need at least one other set of eyes for that, and I don’t mean their spouse or sister-in-law. A professional evaluation by a writing coach or editor will help that writer determine if the project is READY. While that could be costly, it will definitely speed up the process. AM: As you know, I LOVE thrillers that address social issues. Yours does so beautifully. Why are its central issues so important to you? What compelled you to write about them? AM: That’s horribly sad, and one reason I think stories like Freedom’s Hand are so important. You’re skilled at making the reader empathize with and fight for the protagonists, in Freedom’s Hand included. How do you approach character development? MS: My characters are reflective of most human beings: flawed. We’re just ordinary folks trying to get by in a challenging world, hoping to love and be loved. But sometimes, ordinary people are thrust into extraordinary situations—especially in fiction—and it is how they handle these necessary changes that, I believe, appeals to readers. In Freedom’s Hand we have David Lowe, a nerdy schoolteacher from suburban Chicago, suddenly pitted against a host of murdering, racist thugs in order to save his family. In Demon Shadows, successful novelist Paul Fleming has writer’s block because he misses his kids after a contentious divorce. This doesn’t exactly prepare him for the horrors he will soon encounter at an isolated writers’ colony, but somehow he’ll need to rise to the occasion. Bottom line: readers understand my characters because they see some of themselves in them, and they’ll be rooting for them to overcome whatever challenges I choose to throw in their path. AM: You can have dinner anywhere in the world with any two authors—living or dead (but rejuvenated!). Who would you choose? What and where would you dine? MS: The first one, easy: Edgar Rice Burroughs. He is my all-time favorite writer, and my muse. Without him I would never have begun writing. I can think of so many for a second choice, but let’s go with Mark Twain. I think that would be a hoot! His quotes are priceless and often make my day. I would invite them for seafood at one of my two favorite places: the Fish Market in Del Mar or Monterey Bay Canners on Oceanside Harbor. AM: Awesome! I’m coming. Seems as though you’ve been published by just about everyone over the years. What do you love most about being an indie author? MS: Being in control of everything regarding your books. Not having to rely on the whims of a publisher to promote—or not promote—you, or not even matching your own efforts for the small percentage you’ll earn in royalties. Yes, it can be great to have a BNYP (Big New York Publisher), and once in a while even a newbie can become a mega-author. But so much of that potential success may rely on things over which a writer has no control. Let me share one of my own BNYP stories. I landed Bantam Books for my novel, Demon Shadows, and thought I was on my way. I had a champion there, an executive editor who loved my work. She contracted me for a second book, The Well. Demon Shadows started out fine, about 25,000 copies sold per the initial royalty statement. The Well was about to be published. Then, my editor left Bantam. Losing your champion can be death to a writer. The Well was published but put Out of Print less than two months later. It never had a chance. I never received a royalty statement for it, or any other for Demon Shadows. And people wonder why I got out of the game back then? AM: What’s next in the pipeline for you? MS: A historical novel, a real labor of love that has spanned over three decades and is just about ready. It’s a Native American story—what else? Though fictionalized, it is a remarkable true story that deserves to be known by far more people that are presently aware of it. Enough said. Thanks, Mike! Now it’s y’all’s turn. Have any thoughts or questions to share with this fabulous writer? (He’s also a writing coach and has about 20 zillion additional titles out; he’s a mega resource!) Who would you invite to your author date besides me? What would we you eat? You can also connect with Mike Sirota on Facebook, Twitter (he just recently joined!) and his coolio blog, Swords, Specters, and Stuff. His latest post features more juicy bits about Freedom’s Hand! Good stuff. Very perceptive! Thanks again for sharing and mingling with my posse! Wishing you huge success with Freedom’s Hand. Great interview. I really appreciate Mike’s perspective on the various paths to publishing. Ditto! We’re definitely lucky to have choices. I’m so glad you enjoyed his thoughts. Loved this interview, August! Here’s my question for Mike: What are your three favorite and three least-favorite words to use in your writing? Oh, and August, you and I would dine on New York-style pizza with Lee Smith. And, now, I have yet another reason to weasel a spot at the table when you dine with Mark Twain. I’ll be quiet. Mostly. NOTE TO SELF: Use find and replace feature to change very, really, just, it-period-space (the list goes on) to damn. One sweep and I’ll find those culprits. You’re welcome at the table, Gloria! Yes, it was hell doing what I did to my characters. Couldn’t wait for the “getting even” part. Great answer! So glad you dug the interview. I love this interview. It’s awesome! I did connect with Mike on Twitter and see if I can learn from him as much as possible. I really enjoyed reading the interview. As for the book. I’ll add it to the pile of “Must reads”. Thanks for sharing! Thanks, Raani. Until I figure out Twitter (August is my social media guru), you might want to connect on Facebook, too. The advice to either pay for the edits, or submit a debut novel through traditional channels snapped my garter. I’ve read Indie publications from talented writers who published before they and their craft were ready. It’s painful to read lyrical prose waltzing in a plot of mush. That ISBN, those sales numbers, reader perception of your talent stick. I proudly possess a plethora (one of my favorite words) of rejection letters on my first two novels. Both generated requests for fulls. Both garnered “I didn’t connect…” rejections. I took time to study my craft before I tackled the third novel. Loved the interview. Love/hate the premise of your book. That’s a compliment. Suffering, in all its wicked forms (physical, emotional, mental, spiritual), frequently causes me to open the door to The Gloria Richard Adopt-a-Problem Agency. I live with my characters in my head. Was it hell to put yours through that? This book is really moving. My first read of Mike Sirota, but will be adding more to my library. Great interview. Eye-opening and inspirational for indie and hobby writers (I dabble but don’t publish).